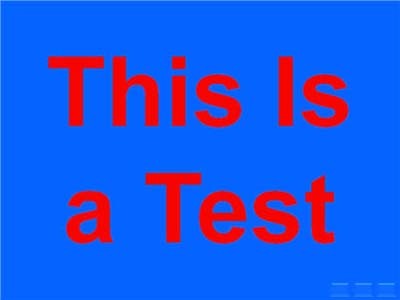 Why do some color combinations work so well in your presentations, and why do other color combinations make your presentations difficult to watch? 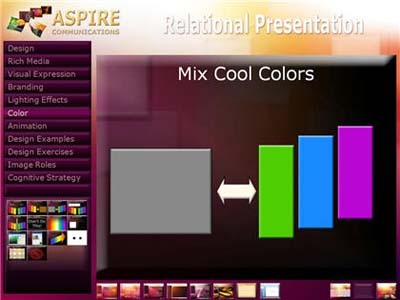 PowerPoint expert Robert Lane explains how to combine colors to make effective and professional-looking slides. 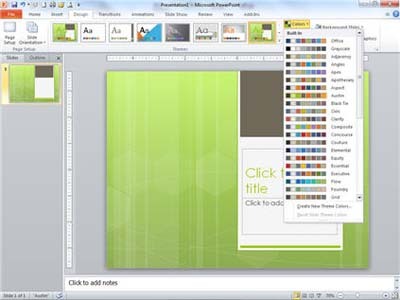 Newer versions of PowerPoint, especially beginning with PowerPoint 2010, have marvelous tools for helping even the “artistically challenged” among us get beyond bullet points and create effective, graphically appealing, downright professional-looking visual slides. That’s fantastic! Now the question is … how should we use those tools? Most of us have never been trained as graphic artists and don’t necessarily know the rules for making visually attractive and meaningful content. Because the discussion of “effective visual communication” might fill an entire book, let’s narrow the focus here to concentrate solely on the use of color in PowerPoint. What are good, and not so good, ways of using color on slides? One way to approach colors is to classify them into two broad groups: warm and cool colors (Figure 1). Reds, oranges, and yellows are referred to as warm colors. They tend to pop out and attract attention—especially a bright red. Greens, blues, and purples are cool colors. They tend to recede into the background and draw less attention, especially darker shades. White and very light colors also catch the eye, whereas black and very dark colors generally are less noticeable. Note, however, that above effects are not absolutely fixed. They can flip. The quantity and contrast of one color compared to another also comes into play. For example, if we place small black shapes on a solid white slide background, the black shapes pop out as more noticeable, versus the sea of white around them (Figure 2). In this case, the brain is more interested in figuring out if shapes communicate some form of meaning or pattern, rather than merely reacting to their color characteristics. Not surprisingly, some optical illusions take advantage of this phenomenon. 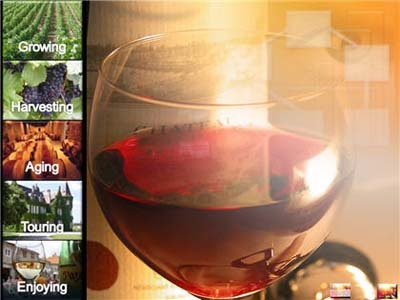 Consider the color groups, as well as quantity and contrast, when combining colors on slides. It’s pretty safe to combine warm colors with each other and shades of brown (Figure 3) or cool colors with each other and shades of gray (Figure 4). White, black, and beige are neutral colors and go well with all colors in either group. 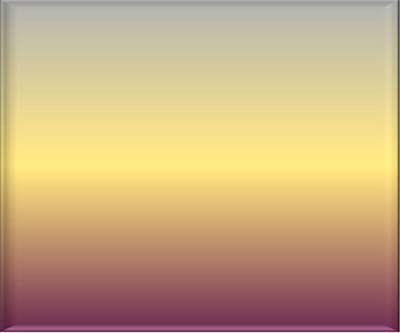 Where most PowerPoint designers get into trouble is combining colors across the warm/cool boundary. Absolutely NEVER do what is depicted in Figures 5 and 6. If you stare at either of these images for very long, your eyes begin screaming. They have trouble distinguishing interactions between the color wavelengths, resulting in fatigue and discomfort. Mixing bright blues and reds is a terrible practice to inflict upon audiences, and unfortunately it happens all too often. The same goes with mixing reds and greens. A red and green combination also brings up the issue of color blindness, which apparently affects approximately 7 percent of men and 1 percent of women. 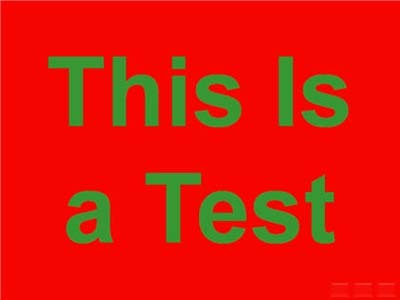 Inability to notice the difference between red and green colors is the most common form of color blindness. For example, let’s say you place green text on a red background, as in Figure 6. If the text color’s shading (amount of darkness) has little contrast with the background color’s shading, some viewers will not be able to read that text at all! 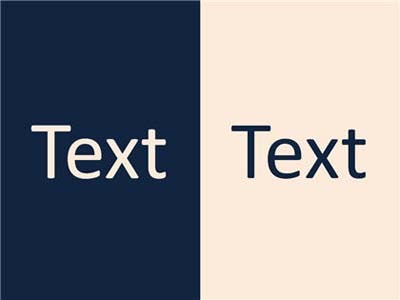 Avoid such problems by never mixing these two colors, especially in a text versus background combination. 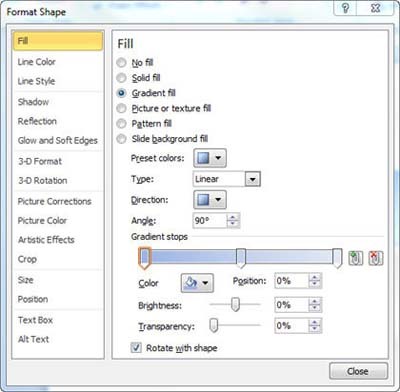 Julie Terberg, a graphic designer and PowerPoint MVP, also points out that using the themes in PowerPoint can make your color combination choices easier (Figure 7). Theme colors have been chosen to look good together (although, still use caution) and to work well in both light and dark presentation environments. Interestingly enough, the process of combining colors is much more forgiving when using gradients—colors that fade into each other. Beginning with version 2010, PowerPoint offers a greatly improved, user-friendly interface for making gradients, by the way (Figure 8). Try blending colors to make a custom-designed slide background, a decorative shape—perhaps for a sectional background (Figure 9) or navigation button (Figure 10)—or even jazzy, 3-D text (Figure 11). Unless there is a particularly good reason for using brightly colored text … don’t. Stick with white or light beige on a dark background or black (or otherwise very dark color) on a light background. Your slides will have a more professional appearance as a result. 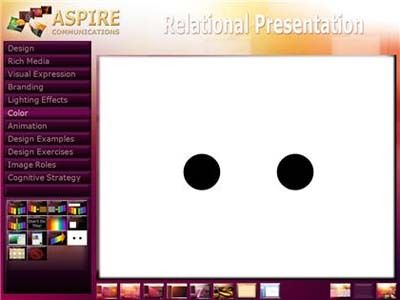 Robert Lane is a US-based presentation consultant specializing in visually interactive communication theory and is the author of Relational Presentation: A Visually Interactive Approach. 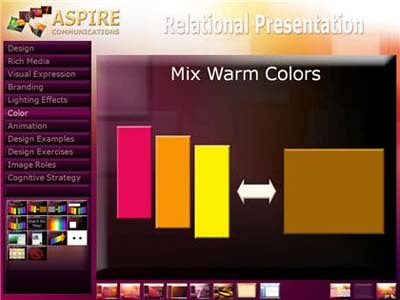 His Web site, www.aspirecommunications.com, features resources that further explain the concepts discussed in this article. Contact him at: rlane@aspirecommunications.com. 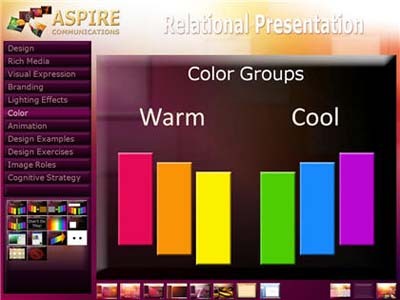 References, visual examples, and additional resources are available on the Aspire web site.